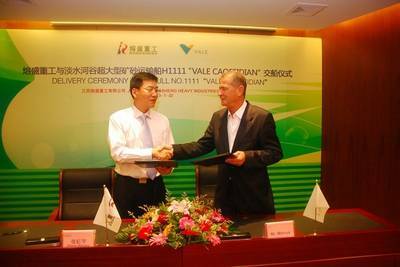 China Rongsheng Heavy Industries Group Holdings Limited has delivered the 380,000 dwt class Very Large Ore Carrier (VLOC) 'Vale Caofeidian' to Brazil's Vale S.A. The vessel is the fourth 380,000 DWT class VLOC delivered by the Group this year and its eleventh delivery of VLOC's overall. The Chinese shipbuilders have successfully delivered 11 VLOCs, while most of those remaining have been launched and are under outfitting process. The next VLOC delivering to Vale is also at its final stage for sea trial. Out of the sixteen 380,000 dwt class VLOCs orders secured by the Group, all the four VLOCs orders from Oman Shipping Company S.A.O.C. have already been delivered. Only 5 more 380,000 DWT class VLOCs are still pending delivery. The 380,000 dwt class VLOC built by China Rongsheng measures 360 meters in length, 65 meters in breadth and 30.4 meters in depth, and is currently the world’s largest VLOC. The self-developed and high-tech vessel type represents the most advanced technology of VLOCs in the world. It adopts an environmentally friendly design focusing on lowering fuel consumption and reducing CO2 emission, while its operating efficiency exceeds most existing ore carriers. With Energy Efficiency Design Index (“EEDI”) recorded at approximately 1.99 during sea trials, Rongsheng-built VLOC's are in line with low-carbon green product initiative and meets the benchmark requirements on emission reduction set by International Maritime Organization (“IMO”), which came into effect as of 1 January 2013.